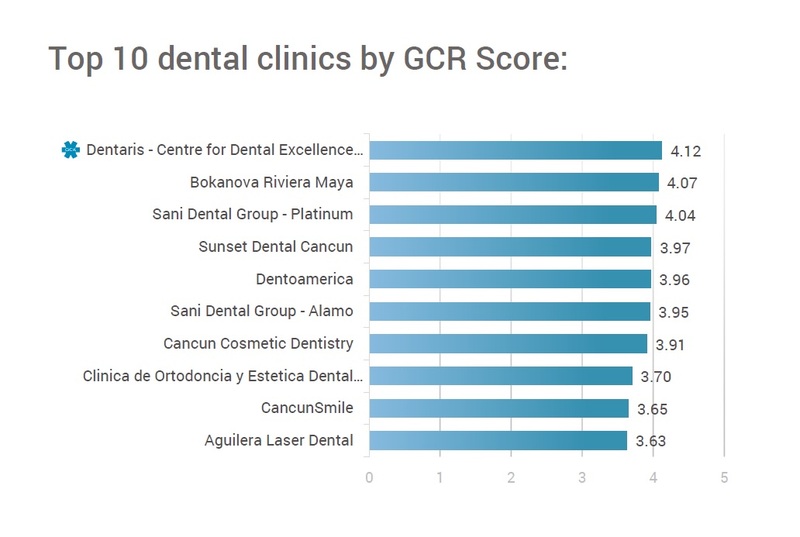 According to the GCR’s latest analysis of TOP 10 Dental Clinics 2017 in Mexico, Dentaris – Centre for Dental Excellence Cancun ranks as the leading clinic, when it comes to overall international clinic reputation. A total of 2170 dental clinics were included in the study. The average GCR dental clinic quality score was 2.4, demonstrating the huge range of rising healthcare standards available in the country. The GCR – Global Clinic Rating, the leading provider of healthcare clinic ratings worldwide, aggregated and analyzed dental clinics throughout the Mexico during 2017 including dental clinics in Cancún, Mexicali, Playa del Carmen, Mexico City and others. Dental clinics were ranked according to their GCR Score, against other clinics in the same country on the level of apparent expertise, services, facilities and patient feedback available by the clinic. The GCR feedback score for the clinics includes patient rating scores from Google & Facebook and other independent rating providers. Dentaris – Centre for Dental Excellence Cancun ranked #1 with a GCR Score of 4.12, and ranks #28 from 127,000 dental clinics monitored worldwide, followed by the Bokanova Riviera Maya (4.07) and the Sani Dental Group – Platinum (4.04). It is important to mention that all of this three clinics came out almost top (4.3-4.9) for their Feedback Score. The GCR Scores may change daily, depending on what has been recently changed within clinics’ expertise, facilities, services and patient feedback. Every little change within clinic’s profile can affect the overall GCR Score of that particular clinic. Medical Tourism in Mexico has been a popular trend for many years. Many Americans choose to travel south of the border for affordable medical care, and rich Mexicans travel to the USA for advanced medical treatments. Private hospitals in Mexico are growing by double-digit after years of stunted growth. The hospital & medical clinic construction boom has been in small clinics & surgery centers, as well as big high-quality hospitals. The GCR clinic star symbol represents that the clinic has been officially verified as meeting or being above international medical clinic standards and uses the data provided by the GCR to constantly improve the clinic for their patients. One clinic in Mexico has achieved the GCR international accredited clinic status. Download the GCR’s full TOP 10 Dental Clinics Report for MEXICO to discover the names of the other dental clinics that made it to the Top 10 dental clinic list in Mexico and to find some brief statistics of these clinics. Thanks for your valuable information. The dental problems are getting more in numbers as compared to various problems. As the dental problems are found in different ages from childhood to old age so it’s better to take precaution before it affects us. Very importantly choosing a right clinic will be a wise decision as its safe your future. I also have suffered from dental problems a few years back and I got a treatment from Global Medical Tourism Inc and I am really pleased with its hospitality and today I don’t even have an issue after so many years also. Maybe it’s not in your top 10 list but it provides the best results. In near future, if any issue occurs I will definitely opt for your top clinics for dental care. Hi Adam, thank you very much for your comment. We will be really glad and happy, if you use our platform GCR.org for your decision-making in the future. Have a nice day!